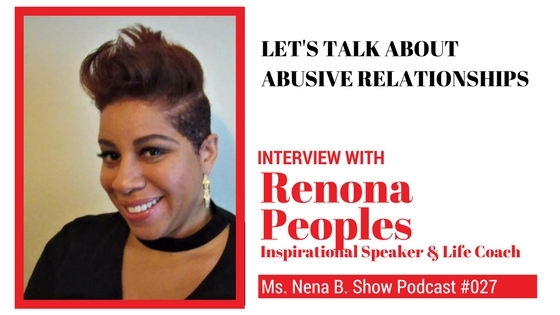 Podcast 027 – Interview with Faith-based Life Coach, Renona Peoples – Let’s talk about Abusive Relationships – Ms. Nena B.
Renona Peoples is an Inspirational Speaker and Faith-based Life Coach. She is an ordained Minister and is a Marriage and Relationship Life Coach. Her Facebook Live Streams have captivated audiences all over where she shares her testimony of surviving domestic violence. She is passionate about sharing a clear action plan on how to prevent and overcome abuse.